The results of the study, published this week in the Proceedings of the National Academy of Sciences, suggest the land plants that form the foundations of many ecosystems are surprisingly resilient and may be a useful tool for the people who have already announced plans to set up a human colony on Mars, researchers said. A team of biologists from the University of Alberta travelled to Ellesmere Island in the Canadian Arctic in order to survey plant life exposed by the retreat of the Teardrop Glacier. Lead researcher Catherine La Farge said the giant ice mass has been shrinking by between three and four metres a year since 2004, exposing larger swaths of plant life for scientists to analyze. La Farge and her team focused their research on bryophytes, a general term given to ecological building blocks like mosses and other non-vascular plants. 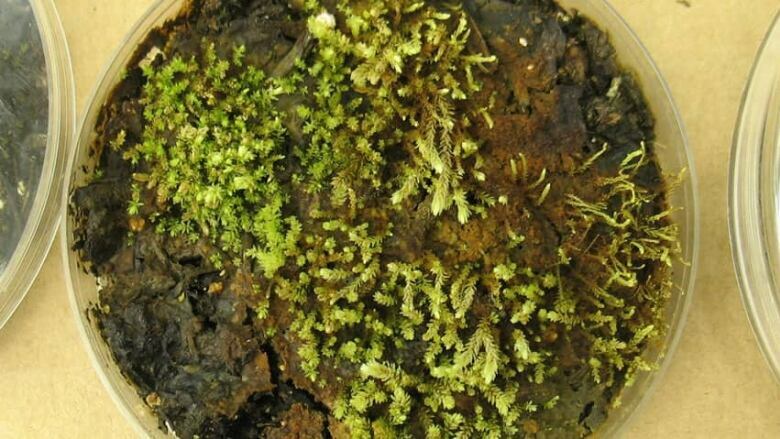 La Farge said researchers were first struck by the fact that bryophytes had been almost perfectly preserved despite the vast quantities of ice that settled over them centuries earlier. 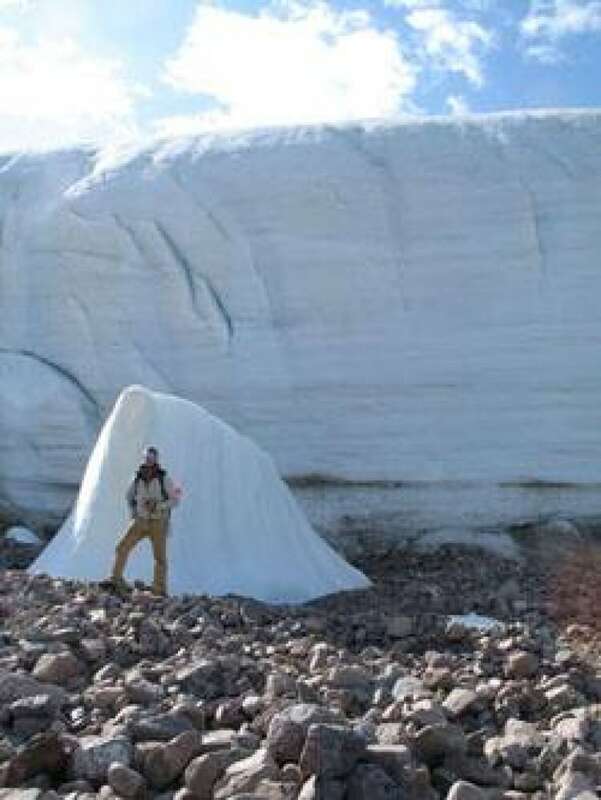 The plants had been buried during the Little Ice Age under the Ellesmere Island's Teardrop Glacier, shown with graduate student David Wilkie for scale. (Catherine La Farge/University of Alberta)"We were sort of blown away by the biomass of intact communities being exhumed from the rapidly retreating glaciers," La Farge said in a telephone interview from Edmonton. Those intact communities — which were entombed by the glacier some time between 1550 and 1850 — showed early signs of being dormant rather than dead, La Farge said. Many of the plants that surfaced still had a greenish tinge despite their time below the ice. It wasn't long, however, before the team observed bright green stems emerging from the recently exposed samples. Such signs suggested the plants had the potential to begin re-growing, but La Farge and her team required more evidence. They collected 140 samples from the island and brought them back to Edmonton in 2009 to see if they could thrive outside their natural environment. "All we did was we took the material, we ground it up, sprinkled it onto a Petri dish and stuck it in the growth chamber to see what would happen," she said. "We had no idea if it would work, we just wanted to make sure that what we were seeing in the samples coming out from under the glacier . . . was that possible." The tests yielded 11 cultures from seven specimens, La Farge said, adding the results hold intriguing implications for those interested in survival under harsh conditions. Bryophytes are one of the most basic forms of land plants, she said, adding mosses and similar species are essential for the growth of more advanced types of plant life. The resilience of bryophytes suggests they may be ideal as trial balloons for researchers exploring the prospect of survival beyond earth, she said. The notion — once the foundation for science fiction plots — has gained popular traction since a Dutch entrepreneur launched the Mars One project. The privately funded initiative aims to send a handful of people on a one-way trip to Mars by 2023. At least 35 Canadians have expressed interest in being among the first to try to colonize the Red Planet. La Farge said sending bryophyte samples ahead of time may be an effective way to test the viability of the plan. "We're not really dealing with a moonscape on the Arctic, but we're definitely under pretty extreme conditions," she said. "We now talk about people . . . wanting to go to Mars and starting a whole new world out there. If you were going to send any kind of plant up there to see whether it could survive, bryophytes would probably be one of your key systems to try."